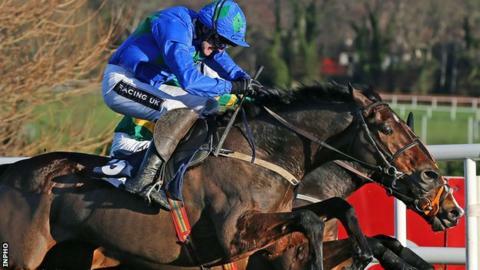 Hurricane Fly clinched a record fifth Irish Champion Hurdle by beating old rival Jezki at Leopardstown on Sunday. The 11-year-old, trained by Willie Mullins and ridden by Ruby Walsh, has won all 10 of his races at the course. Neck-and-neck with Jezki going the last, Hurricane Fly jumped the better to go clear and extend his remarkable world record of Grade One wins to 22. Arctic Fire, the other Mullins entry, overtook AP McCoy's mount Jezki in the run-in to take second place. It was a superb performance from a horse with a huge heart considering that he wasn't 'travelling' from quite some way out. One would have thought now that the Mullins team will run both Hurricane Fly and hot favourite Faugheen in the Champion Hurdle at Cheltenham. How on earth will Walsh decide which to ride? Hurricane Fly was the favourite, but had drifted in the market to 11-10 with the ground drying. Immediately after the race, Boylesports offered the victor at 8-1 for the Cheltenham Champion Hurdle on 10 March, a race won by Jezki last year. For much of the Sunday's race, Hurricane Fly's prospects were not looking that promising. With the pacemaking Plinth fading, Cheltenham hero Jezki took over from the home turn, with Hurricane Fly responding to Walsh's urgings on the inside of the track. The big two headed down to the final flight as one and Hurricane Fly appeared to be getting on top when Jezki blundered. Hurricane Fly galloped all the way to the line to seal yet another momentous triumph. Winning jockey Ruby Walsh: "He didn't travel with the same fluidity as he has done in the past, but I suppose when the going got a little bit tougher going to the second-last he started to pick up. "When he rounded the bend and I got to AP (McCoy, on Jezki) I was thinking 'how much is he going to find? ', but when I saw AP go for his whip I knew I had him covered."